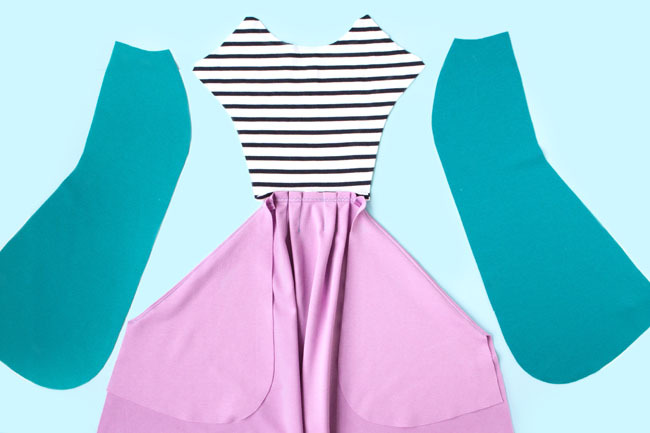 Making the Zadie dress? 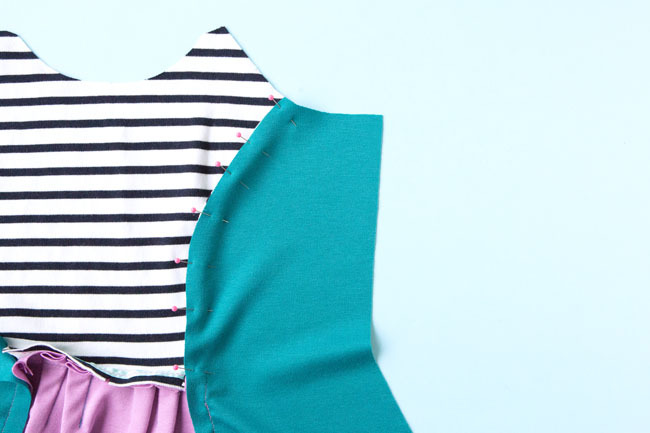 Today I’m going to show you how to put together the pieces to make the front of the dress. Not started your dress yet? 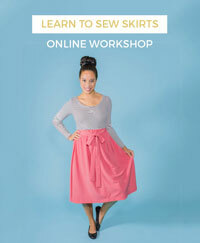 Order your Zadie sewing pattern and catch up on the sewalong! I’m including lots of photos so you can see which pieces and seams I’m referring to, but if you’re still not sure which bit I’m asking you to pin or sew, have a look at the seam labels on the pattern sheets. Our patterns include a 15mm (5/8in) seam allowance – so sew with the raw edges lined up with the 15 or 5/8 guide on your needle plate, unless the step says otherwise. And back tack at each end of the stitching to secure it in place. 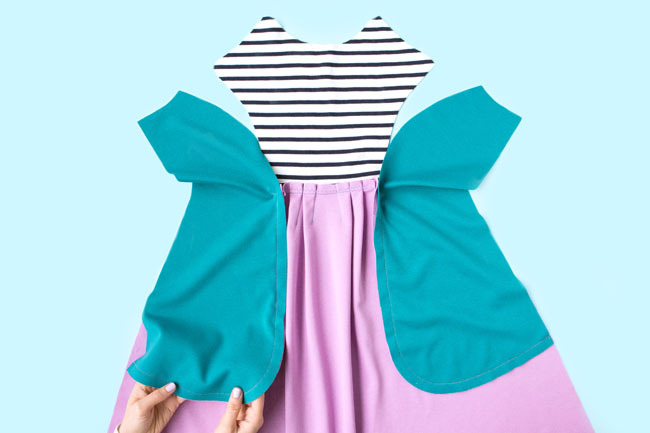 We’re going to start by sewing together the front bodice and the front skirt – so place these pieces right side up on your sewing table. 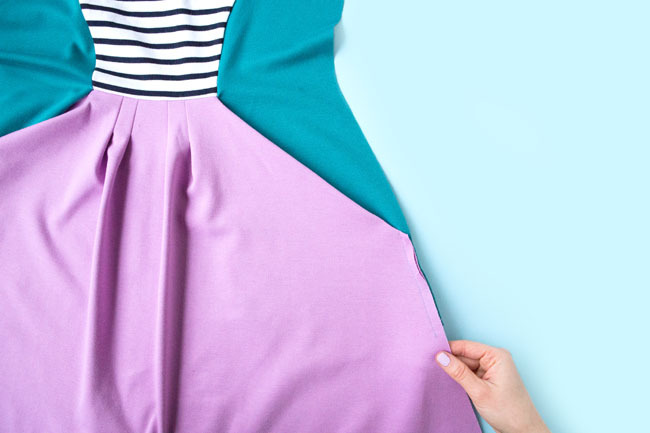 Flip the front bodice over the front skirt at the waistline, so they’re right sides together. 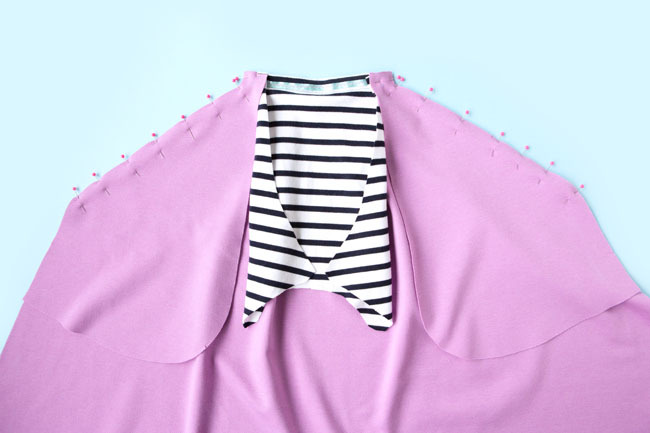 Pin them together along the waistline, matching up the pivot points and the extra notches that you snipped at the centres. 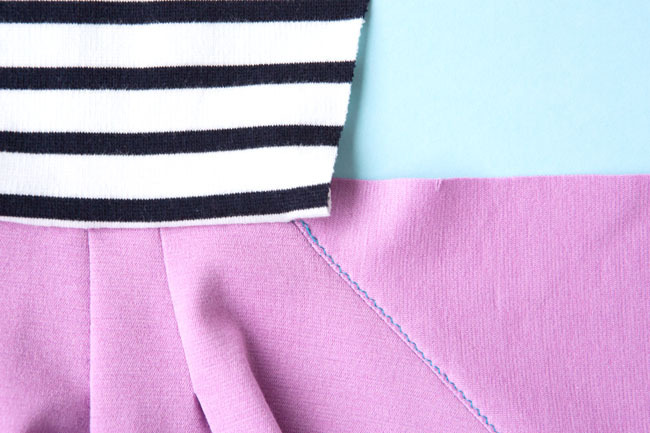 If you're using a printed version of the pattern or a digital pattern downloaded before 24 March 2017, little corners of the front skirt waistline seam allowance may peep out by 0.5cm (1/4in) - just ignore them or snip them off! Unfortunately this discrepancy slipped through our proofing process at the last minute - I'm so sorry. 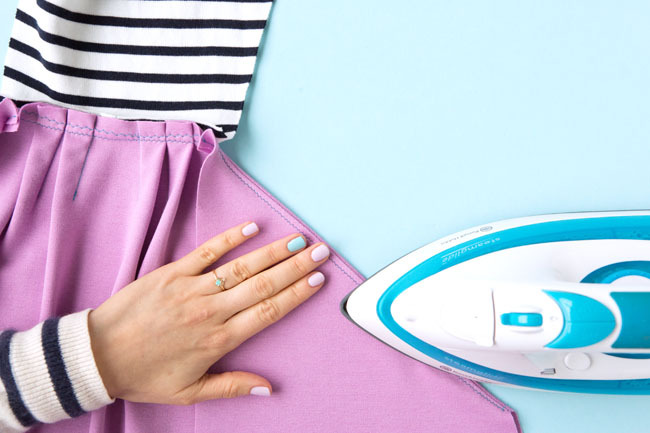 The good news is it's only teeny and won't make a difference to your finished dress. 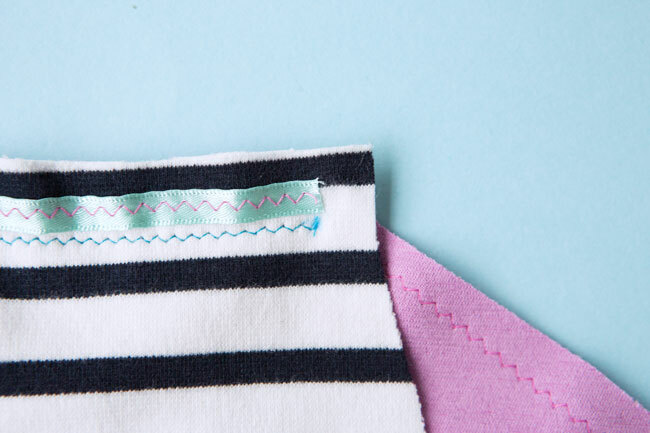 Using a narrow zigzag stitch (about 1-1.5mm wide x 2.2-2.5mm long), sew between the pivot points marked on the fabric, back tacking at each pivot point. Leave each end of the waistline seam beyond the pivot points unstitched. With the front skirt right sides up and the bodice still folded towards the skirt, lay the pocket facings over the skirt, right sides together. Pin them together along the diagonal pocket opening edges, matching notches. 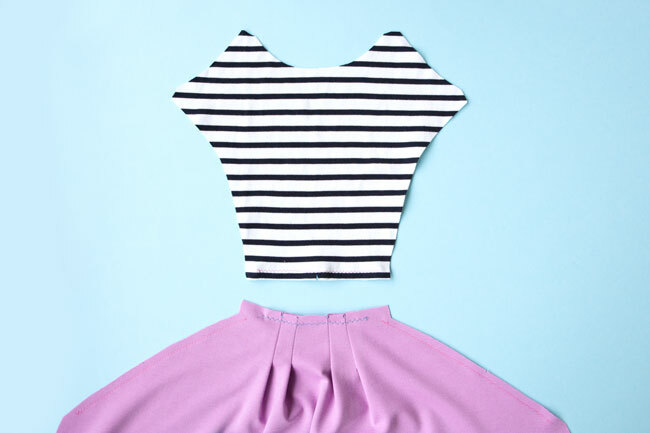 Line up the short top edges of the pocket facings with the raw edges of the waistline seam allowances on the skirt – but fold the bodice out of the way so you’re only pinning the pocket facings to the skirt. 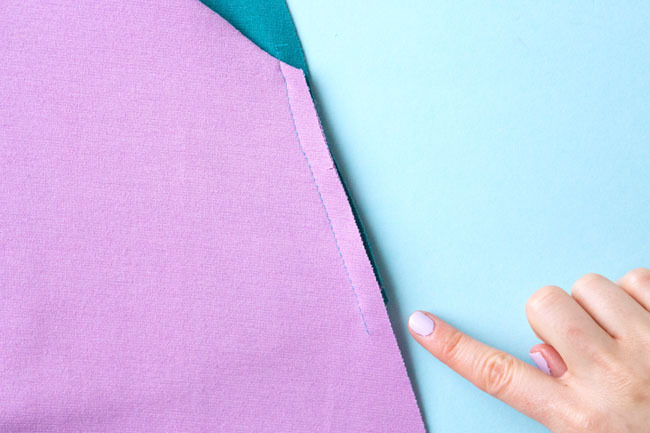 Holding the bodice out of the way at the waistline so it doesn’t get caught in the stitching, narrow zigzag stitch the pocket facings to the skirt – stitch down from the waistline seam, pivot at the pivot point, and then stitch along the diagonal pocket opening edges. 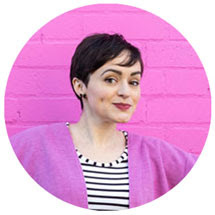 Grade the seam allowances on the seams you’ve just sewn – in this context, grading just means trimming one seam allowance layer more than the other to make the layers less bulky. Be careful not to trim through the stitching that’s attaching the stabiliser to the skirt. 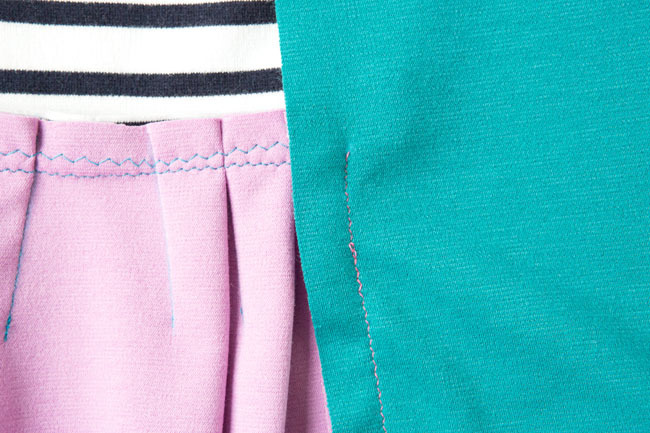 Holding the fabric taut either side away from the seam line, and sewing with a narrow zigzag stitch, understitch the pocket facings to the seam allowances close to the pocket opening seam line. "Understitching" just means stitching a facing to seam allowances to help keep it on the inside of the garment. I’m demonstrating from the wrong side of the fabric so you can see which bits I’m stitching together – but you may prefer to understitch with the right side facing up so you can keep the fabric pulled flat away from the seam line. 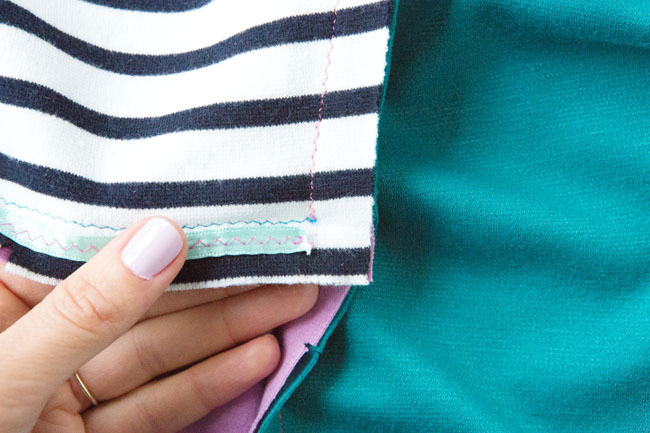 You just need to understitch along the diagonal pocket seam – don’t understitch the top bit of the pocket facing above the waistline seam. This is what the understitching should look like when it’s done. Do this on both pocket facings. 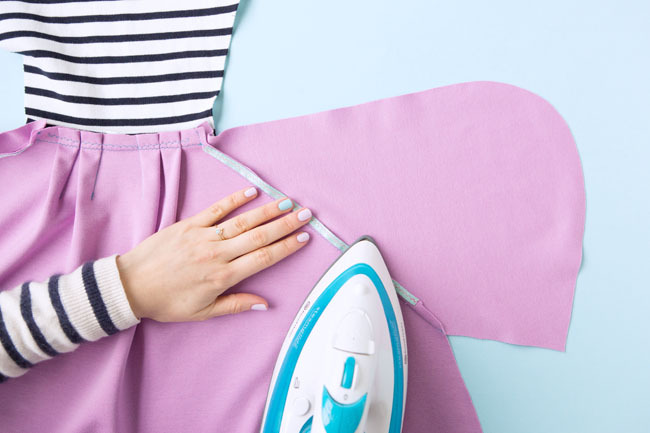 Press the pocket facings to the wrong side of the skirt, rolling the seam lines in by 1-2mm (1/16in) so they won't be visible from the right side. Lay the front dress out wrong side up, with the bodice folded up and with the pocket facings still pressed to the wrong side (so, right side up). Get out your side front panels. Place a side front panel on top of each pocket facing, right sides together. 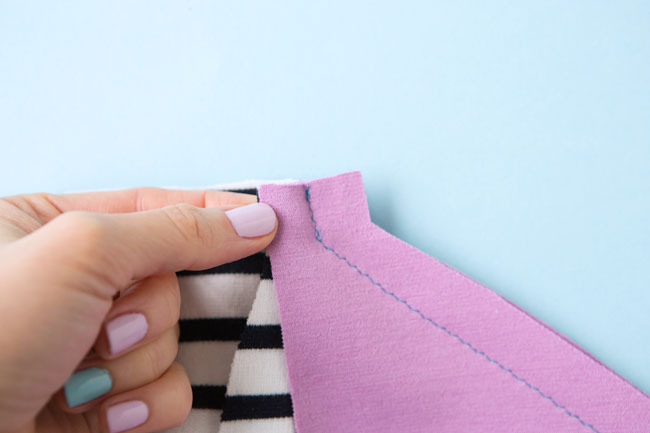 Pin the bottom half of the panel to the pocket facing at the pocket curve seams, matching notches – this is the lower half of the long curved edge, below the pivot point (which should be directly on top of the waistline seam). 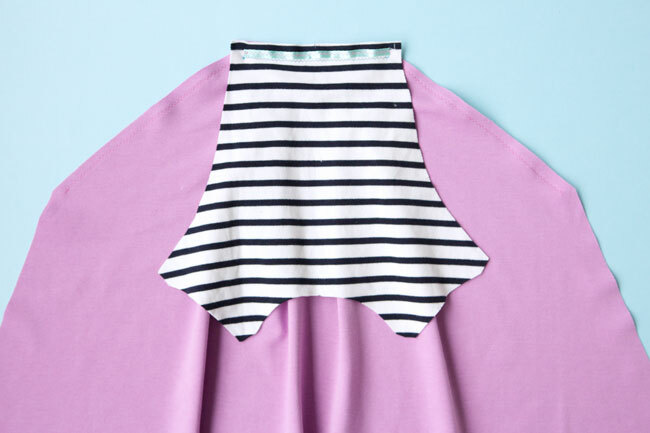 Narrow zigzag stitch between the pivot point and the bottom of the pocket curve – you’re just sewing the side front panel to the pocket facing, so don’t sew through the skirt or bodice. 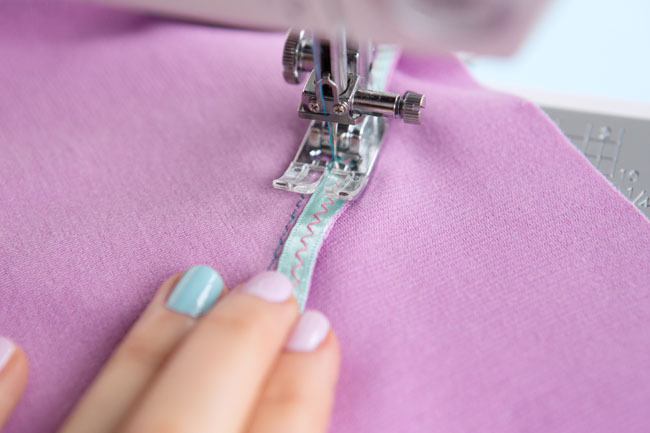 Folding the bodice and waistline seam allowances up and out of the way, lower the needle on your machine through the pivot point – you can then raise the presser foot and check with your fingers that the seam allowance flaps are still folded out the way before you start sewing. The pivot point that you’re sewing from should also be the exact point where the pocket opening stitching meets the waistline stitching. Check your stitching goes right up to this point on the waistline seam so you don’t leave any holes in your dress. Pin the front bodice to the side front panel along the bodice seam, right sides together, matching notches. Folding the waistline seam allowances down and out of the way, narrow zigzag stitch between the top of the seam and the pivot point, back tacking securely. Trim the waistline seam allowances, without cutting through the stitching that’s attaching the stabilising tape to the bodice. If you have an overlocker or serger, now’s the time you can overlock the seam allowances together (or you can leave them raw). Press the waistline seam allowances up towards the bodice. 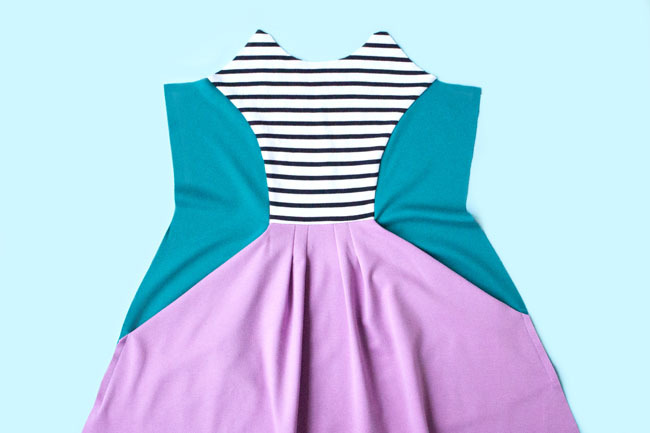 Trim the bodice and pocket curve seam allowances, and overlock them together if you want to. Press the bodice seam allowances towards the bodice. This is what the front dress should look like from the right side. So far so gorgeous! 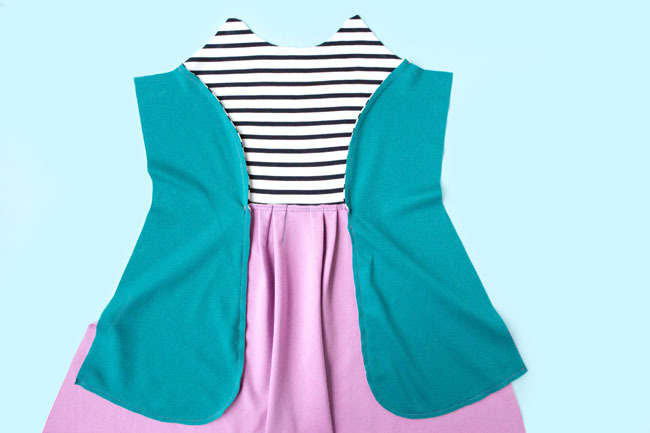 I’d love to see how you’re getting on with your Zadie dress – do share pics of your work in progress (and finished dress!) 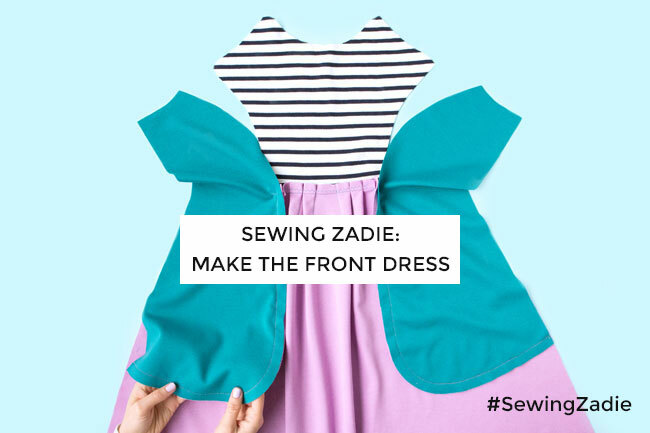 on Instagram @TillyButtons using the hashtag #SewingZadie so we can all see.